Fifteen years ago, Pottermania was still on the rise; the first Harry Potter movie had just been released, and we were in the interminable wait in between the fourth and fifth books. When the fifth, sixth, and seventh books came out, bookstores held midnight release parties, where people stood in line, waiting with bated breath for the countdown to end, so they could race home and start reading. 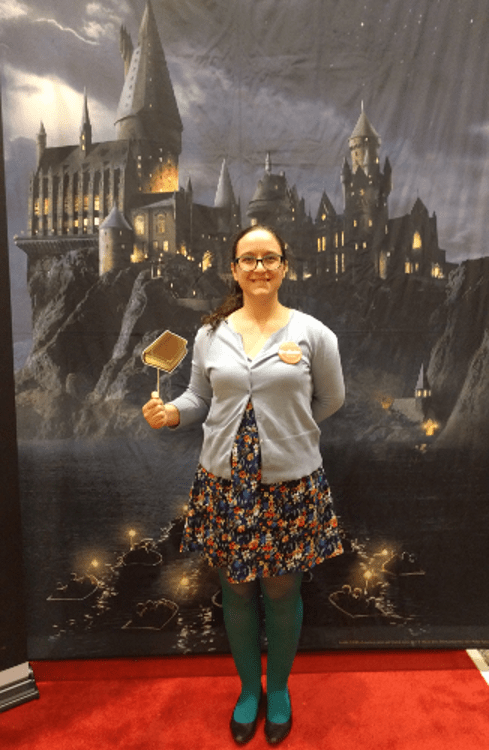 But before the explosion of boxes and paper, there was the party part: the community gathering, where people came together to celebrate the magical world and wonderful characters that J. K. Rowling created. That feeling, although perhaps without the almost-painful anticipation, suffused the Minneapolis Convention Center Friday night. 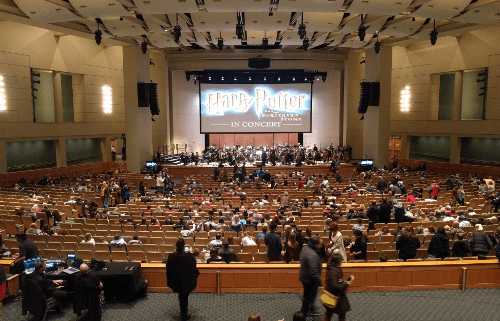 CineConcerts, in partnership with Warner Brothers, has put together a tour of screenings of each of the eight Harry Potter movies to be performed with live orchestras around the world. Performance locations include the United States, Canada, Europe, and Australia, and this weekend the tour for Harry Potter and the Sorcerer’s Stone hit the Twin Cities. The first performance was December 9, and there are two more on today, December 10, at 1:00 and 7:00 p.m. A few tickets are still available, at prices ranging from $30 to $90. Please note my red Gryffindor button. Half an hour before the concert there is a screening of a behind-the-scenes extra, although I missed it, so I don’t know what it entails. It’s also worth getting there early for the merchandise table at one end of the lobby and the free photo booth nearby. Both were also available at intermission, and I jumped in line. The professional photographer was happy to take a picture with my cell phone after the official photo with her camera, and the pro photo came out of a small printer a few seconds after she was done. There were props, including Harry Potter glasses and magical items on sticks; I accidentally walked off with my book-on-a-stick and had to run to return it before intermission ended. Perhaps a third of the audience was wearing some sort of costume. They ranged from full-blown, movie-accurate cosplay to the “cool dad” wearing a Gryffindor tie with his otherwise-Muggle dress clothes. Between seeing all the excellent costumes and the photo booth, I was a little disappointed that I hadn’t actually dug out my old wizarding robes and had only opted for my Gryffindor badge. I’d definitely recommend that anyone attending the events today or in the future wear costumes or at least their house scarf. Because we are a geek community, I spoke with one of my friends who has played similar gigs about the technical aspects of an orchestra playing live with a prerecorded film. She informed me that it’s very similar to the orchestra recording the soundtrack for the first time. The orchestra is generally provided with carefully numbered music as well as what’s called a “click track,” a recording that makes a quiet sound for every beat of every measure that they play, including all tempo changes. The conductor has the click track as well, and a monitor playing the movie simultaneously with the movie that the audience sees. (Editor’s note: Nicholas Buc reached out to us on Twitter to note that for this particular performance, the orchestra is not using a click track.) On the conductor’s version of the movie, though, there are some additions: a white dot in the middle of the picture at the beginning of every measure, the number of the track that the orchestra is performing in the bottom right, the measure and beat numbers in the upper right, and the running time of the movie in the upper left. Various colored bars showing when to start, when to stop, and when to come back in after a pause or with a sudden tempo change also run across the screen at times. The sound technician has the same view on one of their monitors, which I could see from my seat in the auditorium. The orchestra and choir are carefully miked to recreate the soundscape of the score as closely as possible, but it’s still a much more dimensional sound than the score. It is also generally louder than the score would be in the actual movie, but for audience members concerned with missing dialogue, the movie was subtitled. At the beginning the percussion and keyboard were a little louder than I had been expecting, and the horns a little softer, but either the sound technician corrected this imbalance or I stopped noticing once the performance was underway. As a concert, it was pleasant; the orchestra and choir both performed well. At times I thought the choir could have been louder, but they blended so well into the music that really, they were the perfect volume. Several orchestral musicians stood out to me: the keyboard player (who covered the celeste—the tinkly instrument that plays the opening theme), the harpist (who played “Fluffy’s Harp” flawlessly), and the percussion section (who spent most of the concert running from instrument to instrument). As a film, well, it’s best to allow the acting (and overacting) of the young members of the cast to be endearing rather than irritating. As a social experience, though, it was outstanding: hundreds of people in a room all watching a beloved film together, all clapping disproportionately for the dearly departed Alan Rickman as Snape, all hissing at Draco Malfoy (well, not all) . . . for Potterheads, it’s not to be missed. Dig out your wand and your scarf and let the feeling you had when you first heard Hagrid say, “Yer a wizard, Harry!” wash over you again. I wish I was able to go to this! It seems like you had a lot of fun!